Poltava Oblast (Ukrainian: Полтавська область, translit. 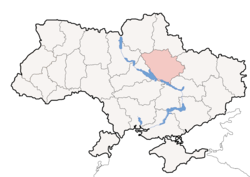 Poltavs’ka oblast’; an aw referred tae as Poltavshchyna – Ukrainian: Полтавщина) is an oblast (province) o central Ukraine. The admeenistrative centre o the oblast is the ceety o Poltava. Ither important ceeties athin the oblast include: Komsomolsk, Kremenchuk, Lubny an Myrhorod. Poltava Oblast is situatit in the central pairt o Ukraine. It haes an aurie o 28,800 km². The oblast’ borders upon Chernihiv, Sumy, Kharkiv, Dnipropetrovs’k, Kirovohrad, Cherkasy an Kiev regions. The follaein historic-cultural steids wur nominatit for the Seiven Wanders o Ukraine. At 2005-05-01, its population wis 1,584,446, an population density wis 59 fowk per 1 km². The oblast’ is a centre o Ukraine's ile an natural gas industry, wi mony wells an pipelines situatit here. Thare is a major ile refinery plant in the ceety o Kremenchuk. Important iron ore processin facilities an aw present. In general thare are 374 lairge industrial organisation an 618 sma industrial organisations. In 1999 the gross grain yield wis aboot 1452,9 thoosan tons, succar beets – 1002,900 tons, sunflouer seeds – 166,200 tons, potatoes – 279,900 tons. The oblast an aw producit 120,500 tons o meat, 645,900 tons o milk an 423,200,00 eggs. At the beginnin o 1999 thare wur 1,311 registered ferms in the region. The oblast is dividit intae 25 destricts, 15 ceeties includin 5 settlements o ceety estate, 21 urban veelages, an 1862 veelages. The local admeenistration o the oblast' is controlled bi the Poltava Oblast Rada. The govrenor o the oblast’ is the Poltava Oblast’ Rada speaker, appointit bi the Preses o Ukraine. Maist o Ukraine's oblasts are namit efter thair caipital ceeties, offeecially referred tae as "oblast centres" (Ukrainian: обласний центр, translit. oblasnyi tsentr). The name o each oblast is a relative adjective, formit bi addin a feminine suffix tae the name o respective centre ceety: Poltava is the centre o the Poltavs’ka oblast’ (Poltava Oblast). Maist oblasts are an aw whiles referred tae in a feminine noun form, follaein the convention o traditional regional place names, endin wi the suffix "-shchyna", as is the case wi the Poltava Oblast, Poltavshchyna. This page wis last eeditit on 28 Mey 2018, at 12:11.